This was my very first velomobile back in 2002. 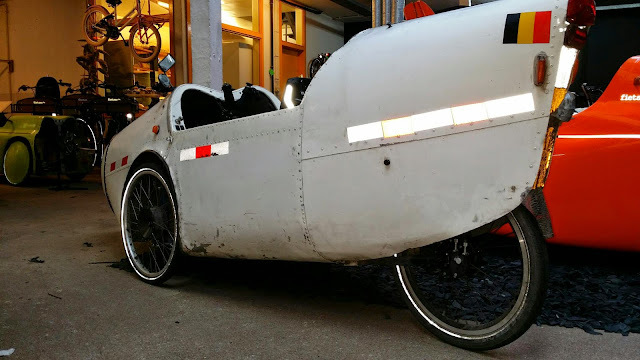 And it has been a first velomobile for many a happy cyclist ever since. Not all FAWs were created equal, and this was a particularly good one. I bought it from a Dutch retired electrical engineer who stripped her back completely to the last rivet, and reassembled her carefully. After spending his first year of retirement restoring his FAW, he rode about an hour in it, found it too slow and scary all the same, and sold it. The Alleweders wandered notoriously in corners. One of my first cycle engineering feats was improving roadability by swapping the single rear suspension arm for a good two-sided fork. The rear suspension was further stiffened by adding a second suspension unit on the other side. This improved roadholding tremendously. 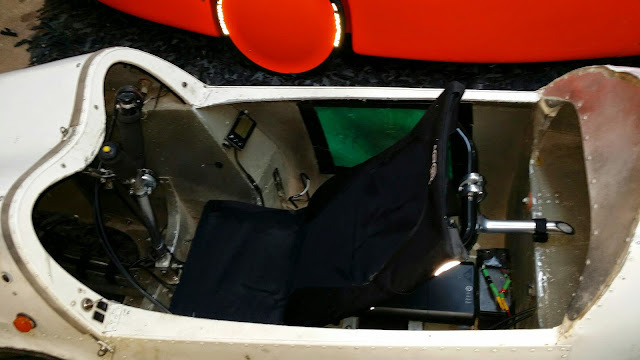 I enlarged the cockpit as well by folding back the rear bulkhead. A Rohloff was added when I got knee pain, this resolved the knee problem but it reduced my cruising speed under the psychological threshold of 40 km/h. A few years ago we had a déjà-vu experience as she belonged to a Brussels' architect, who upgraded and bought my WAW. For the current owner we installed a new Rohloff, a Bafang bracket motor and a comfortable ICE mesh seat. Surely this must be the world's most luxurious Alleweder now. In this picture: custom Rohloff shifter, brushed aluminium LCD display for pedelec-operated bracket motor, ICE mesh seat, removable lithium-ion battery.